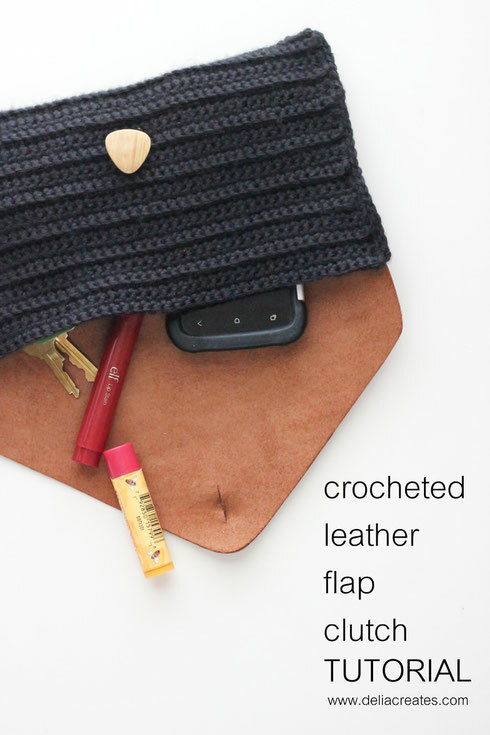 It combines two things I love: crochet texture and leather. If you are a regular reader, than you know I have an ongoing crochet series called Hip Hooks. If you are new to crochet, I started in the Fall with some very beginner projects and patterns and have worked up to more difficult ones like this one. It is still a beginner project, but takes just a little bit more time and skill. Punch 25 holes evenly across the straight edge of the flap and two holes up the sides of the flap, on each side. 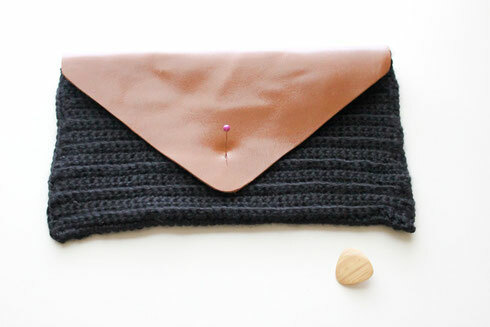 Crocheted Leather Flap Clutch (3 of 66)Prepare your hook. 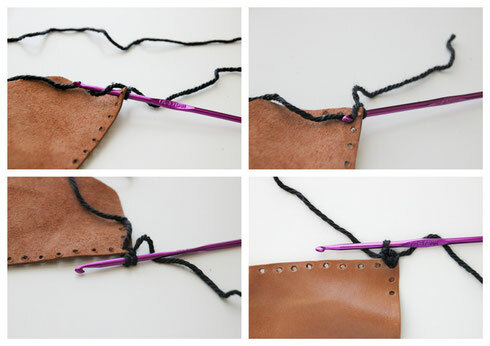 Now, you will begin by single crocheting (sc) into the leather holes along the straight edge. Blocking is essentially knitting and crochet’s version of ironing. There are several ways to block crochet and knitted items, but the idea is basically setting the shape of whatever you just made so it ‘s not warped and so it lays nice and even. Take your button and draw a line exactly the height of the button onto the wrong side of the leather flap, with a fabric or air erasing marker (mine is from the Ribbon Retreat). 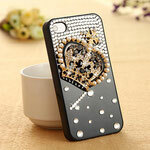 You don’t want to or need to make it larger, because the leather stretches to accommodate the button. Using sharp scissors, carefully cut the button hole line you just created. Now, fold the flap over and mark the middle of the button hole with a pin. 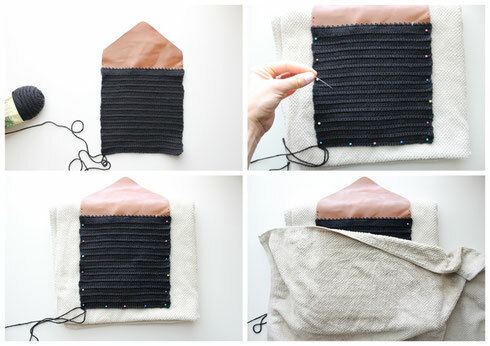 Open up the flap, letting the pin pass through the button hole. This is where you need to hand sew your button on. 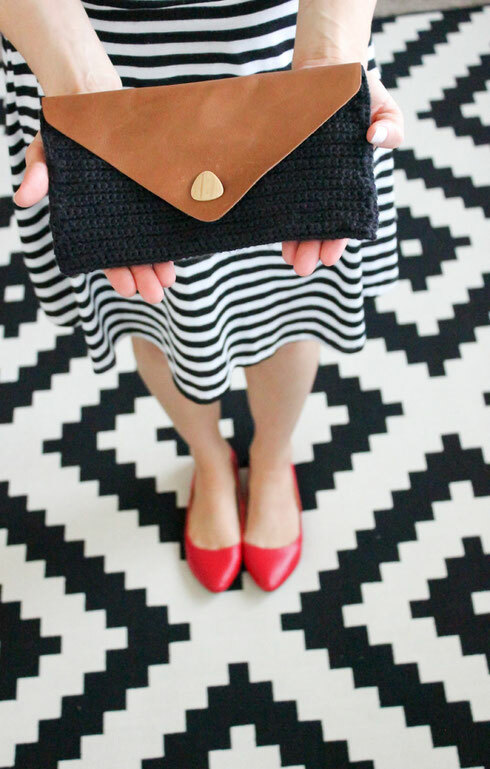 Be sure to only sew through the top layer, so the clutch remains functional. 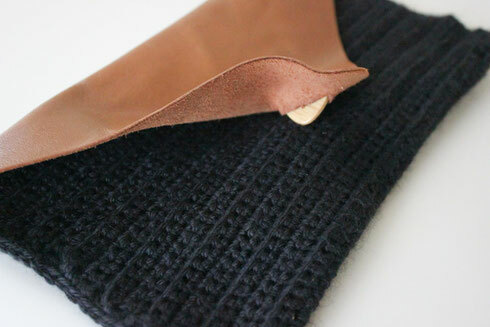 The finished clutch is about 9 x 5.25 inches. Not a heavy hitting diaper bag ;) but great for carrying around small essentials. 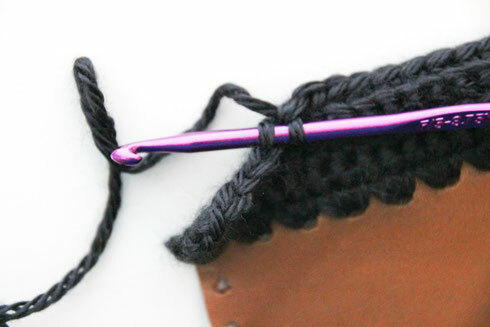 We will also cover how to do a sc bl stitch, which means you will be single crocheting in the back loops only at certain points in the tutorial. 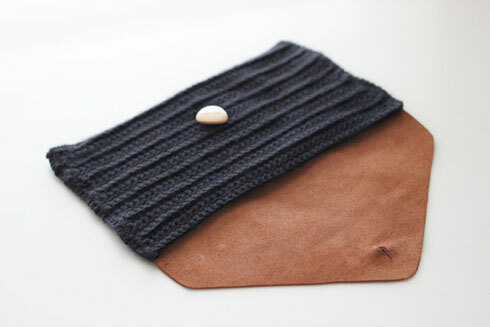 Download my FREE pattern HERE for the leather flap. Cut out the paper pattern, trace it onto your leather and cut that out. 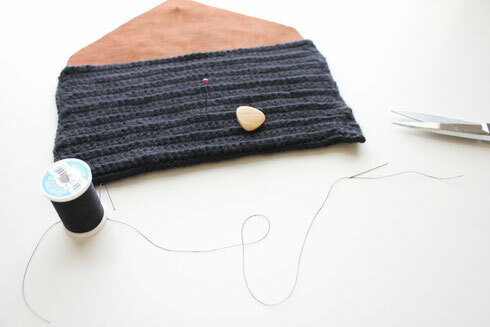 …and crochet into each hole twice until you reach the other side. This is your foundation row. On the fourth row (not including the foundation row), you will crochet into the back loops only. Typically you would slide your hook under two top loops, but this time, you will only pick up the back loop. This helps create a nice texture for the outside of the clutch. It can be a little tricky to get the hang of, but one you get going, it gets easier. Do the sc bl stitch for the remainder of the row, ch 1 and then turn. Sc three rows of 50, then sc bl another row. You will continue this pattern of 3 rows of sc and 1 row of sc bl, 12 more times or a total of 14 times. Do not tie of your yarn when you get to the end of the pattern. 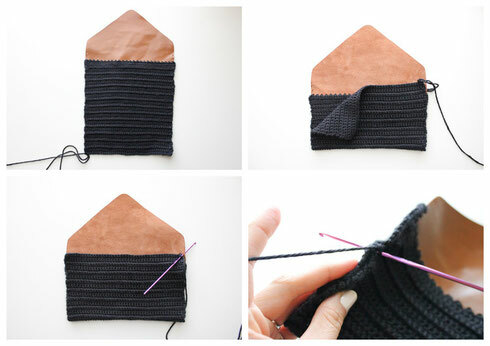 Instead, pull the loop out far enough, so your work doesn’t accidentally get pulled out. Now, this is optional, but I am going to show you how to block your work. Now, let’s bring the clutch together. Fold the bottom up, so that the right side of the leather faces out. Make sure that the bottom overlaps the inside of the leather flap about one inch, and matches up to the two side holes you made earlier. Check to see that the back loop stripes match up on the sides as well. Single crochet twice into each of the side holes, and then sc into the matched up rows down to the bottom. Tie it off. Sc along the other side, weaving the tail in as you go, tie it off. Using a yarn needle with a large eye, weave in the the ends. 1. Cut paper pattern (click HERE for pattern) for the leather flap. 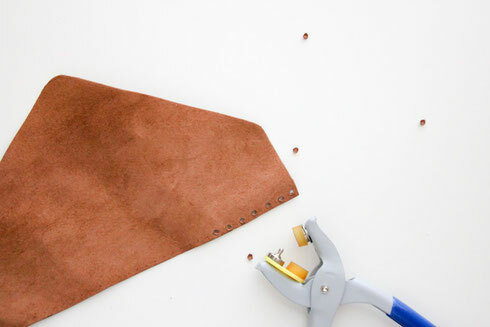 Trace and cut the leather flap. 2. Punch 25 holes along the straight edge of the flap, and two holes up each side. 4. Row 1: Ch. 1, turn. Sc 50. Row 4: Ch. 1, turn, sc bl 50. Row 5-7: Repeat row 1. Row 9-11: Repeat row 1. Row 13-15: Repeat row 1. Row 17-19: Repeat row 1. Row 20: Repeat row 4. Row 21-23: Repeat row 1. Row 24: Repeat row 4. Row 25-27: Repeat row 1. Row 28: Repeat row 4. Row 29-31: Repeat row 1. Row 32: Repeat row 4. Row 33-35: Repeat row 1. Row 36: Repeat row 4. Row 37-39: Repeat row 1. Row 40: Repeat row 4. Row 41-43: Repeat row 1. Row 44: Repeat row 4. Row 45-47: Repeat row 1. Row 48: Repeat row 4. Row 49-51: Repeat row 1. Row 52: Repeat row 4. Row 53-55: Repeat row 1. Row 56: Repeat row 4. 5. Block your work (optional). 6. Sc crochet up the sides and into the side holes two times per hole. Tie off. 7. Weave in the ends. 8. Cut a buttonhole and hand sew on your button.